GUIDING: Piping systems that contain expansion and contraction absorbing devices tend to buckle under the compressive forces in the system. Due to the flexibility of the expansion joint or compensator and the internal pressure thrust loading, the pipe acts as a column that must be properly guided to prevent buckling. The piping must be properly guided with at least two v so neither the compensator nor the piping can squirm out of the piping centerline. Pipe hangers and supports are not guides. Guides are not for supporting piping systems. ANCHORING: Pipeline and/or expansion joint and compensator failures can be caused by under designed or inadequate anchors on the piping system. Main anchors restrain the ends of the piping so that all expansion is directed into the compensator. 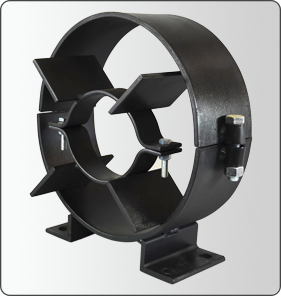 Anchors must be able to withstand the pressure thrust load, the deflection forces, and the guiding frictional forces. Anchors are required at each pipeline direction change, blind end, valve, major branch connection, or change in pipe diameter. Guides and anchors must be installed per EJMA specifications.